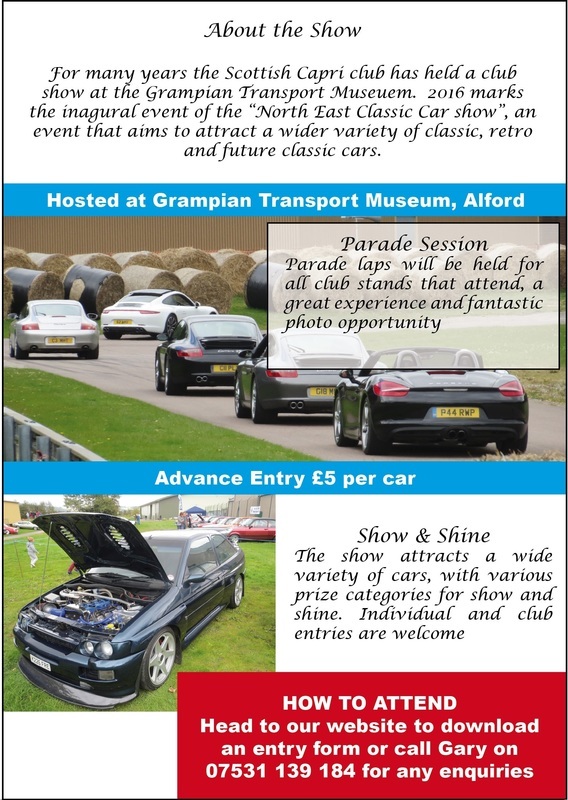 It's with great delight that we can announce that the Scottish Capri Club will host the inaugural "North East Classic Car Show" in the grounds of Grampian Transport museum, Alford, Aberdeenshire on the 28th August 2016. The show aim's to attract a wide ranging variety of classic and future classic owners and clubs from the region and indeed further afield. Since 1991 the club has been hosting a club show in the grounds of Alford, however with the decreasing number of Capri's on the road the show became unsustainable in its original format. We have seen time and time again that many clubs would have historically hosted their own shows or would like to hold their own show no longer can due to cost or resource restrictions. 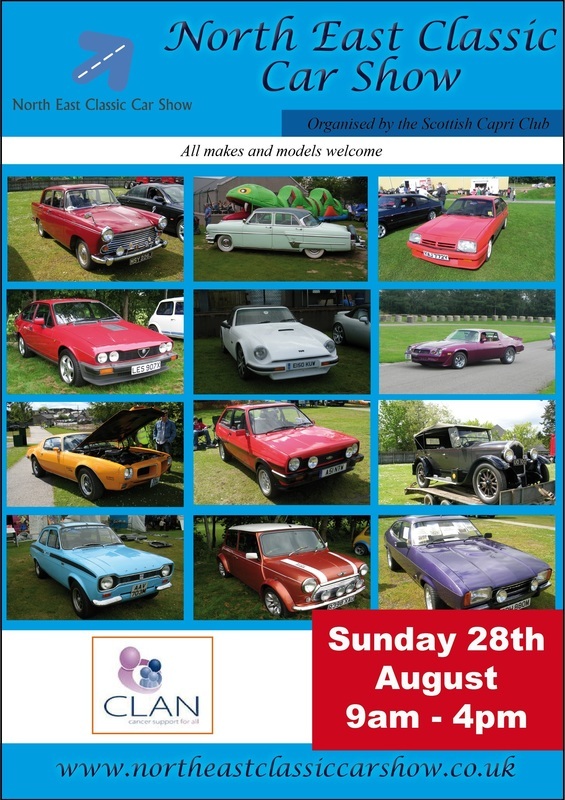 As such we have created the first ever "North East Classic Car Show" and we hope to attract all such clubs to this show which will have something for everyone regardless of marque or era that interests you the most. The show will be primarily static however the demonstration track will be utilised for parade laps and other fun activities. The show grounds will open at 9am with all car clubs and individuals requests to be onsite by 10am. We hope to attract a variety of club stands and trade stands. Please see following sections if you can help with either. All club's are welcome to attend the show regardless of marque or model. Clubs will be invited to participate in the parade laps giving the drivers an opportunity to demonstrate their cars, something not usually possible in static shows. It also allows the public to see the cars and creates some great photo opportunities for all. Downloadable entry forms are available here. We appreciate not everyone who wishes to attend such shows are members of a car club and as such we welcome individual entries also. Where possible individuals will be grouped together and also provided the opportunity to complete some parade laps. We would encourage any trade stand to get in touch if they would like to exhibit at the show. We are particularly looking for trade stands that are related to the show, i.e car supplies, polish, restoration, garage services, wheel refurbishment etc. Please get in touch (see contact section) if you can help. In addition to Trade stands we are looking for show sponsors. We have a variety of options, from an advert in the show magazine, to a sponsorship of a trophy to a fully fledged show partner. Please get in touch if you would like to help in any way. The show wouldn't be worth the effort unless we were giving something back. We are planning to support the charity "CLAN" with this show. CLAN Cancer Support is a well-established local charity providing emotional and practical support to people affected by cancer across north-east Scotland, Moray, Orkney and Shetland. They offer a relaxed, welcoming and caring environment both at CLAN House, their purpose-built support and wellbeing centre in Aberdeen, and at their many bases around the community. Exhibitor entry forms will be available to download in the next few weeks. Entry costs just £5 per car for advance entry. The closing date for entry forms will be the 31st of July. Depending on demand we may be able to accommodate late entries on the day. These will be £8 (subject to availability). General public entry will be free, however, we will have donation buckets at the gate should you wish to support the show and our chosen charity. We will have a number of prize categories and will be judging these throughout the day. Categories will be confirmed on the website once confirmed. Prize giving and raffle will be at the main marquee from around 3:30pm. Should any clubs wish to have their own club prize (such as best club car), if they supply the trophy we will also include this as part of the prize giving. Should you have any enquiries on the show please do not hesitate to contact us at scottishcapri@hotmail.co.uk and we will respond as soon as we can.